A few days ago I shared a video from the Weston A. Price Foundation titled Tips for Limited Time and a Limited Budget by Sara Pope. In this video it is mentioned that by incorporating large amounts of broth into the diet, meat can be consumed only once or twice a week with good health being maintained. Homemade broth acts as a protein sparer allowing the body to more fully utilize the complete proteins that are eaten. A quote from the Weston A. Price website really gives great information on the benefits of broth. For more information on this read Broth is Beautiful. Also, homemade broth made out of ‘leftover’ bones or inexpensive soup bones is extremely economical. If you are new to real/whole/traditional foods or have yet to incorporate broth into your diet, winter is a spectacular time to start. Soups, stews and chili’s are ‘normal’ and natural during the winter. Starting with nourishing broth makes these familiar foods nutritional powerhouses. Bone broth is very simple to make with many different methods for preparing available. 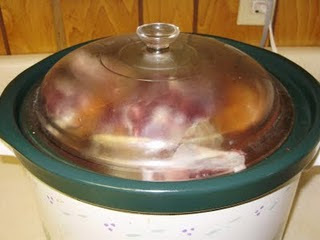 I use a crock pot to make my broth (see this post), here is a video included in the Weston A. Price Beginner Video’s on Stocks and Soups, Amanda Rose offers a Bone Broth Tutorial on facebook plus also this great guest post at Cooking Traditional Foods and Jenny at Nourished Kitchen keeps a Perpetual Broth going in her slow cooker. Need ideas/recipes for adding bone broth to your diet/menu plan? KerryAnn at Cooking Traditional Foods has a Bone Broth Marathon in process with great recipes and information. I cook beans in broth to up the nutrition of the beans while keeping our real food meals budget friendly. Take a look at my 13 week rotating menu plan for many bean ideas/recipes. Soups and Stews are delicious and easy to make using a basic formula. For a very frugal and tasty soup check out this Barley Soup. Rice, Quinoa, and other grains can be cooked in broth (soak first in an acidic medium). A few of my families favorite dishes rich in broth include Beef and Bean Enchilada Casserole, Navajo Tacos, and Garbanzo Bean Curry. Keeping it incredibly simple, eggs are terrific poached in broth and even simpler a mug of hot salted broth tastes spectacular on a cold winters day. With broth being so easy to make and having so much nutritional bang for the cost, I believe that it is a great place to start for someone new to real/whole/traditional foods. Or maybe you are like me and just need a quick reminder about the benefits of broth. Please share your favorite broth use or recipe in the comments.